Earlier this month, Bear Stearns bailed out two sub-prime focused hedge funds. Fears have grown in recent weeks that the downturn in the housing market, prompted by more people's inability to pay their mortgages, will cause instability and retrenchment in the wider economy. But the June minutes from the Federal Reserve's rate-setting committee showed that despite the continued housing slump, inflation remained the central bank's overriding concern. The decision to leave interest rates on hold at 5.25% was underpinned by fears that core inflation, stripping out volatile energy and food prices, would fail to recede. Economists now expect rates to stay at that level for the rest of the year. In two days of testimony before US legislators, Mr Bernanke has sounded a persistently downbeat note on the state of the housing market and the woes of the sub-prime sector, which have led to the collapse of about 30 lenders. 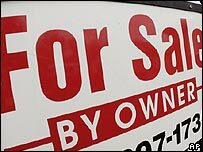 The Fed's handling of the sub-prime market, which it regulates, came under fire from senators, who argued it should have done more to protect vulnerable consumers from inappropriate and improper mortgage practices. "In my mind, this is not just simply a time for suggestions, it is a time for solutions." 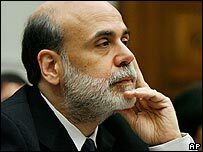 Mr Bernanke said the Fed was reviewing current regulations on lending practices in a "responsible" manner. Worries over the economic outlook have not daunted investors, with the leading US share index, the Dow Jones Industrial Average, closing above 14,000 for the first time.